Glass fishing floats capture the spirit of finding a treasure on the beach. These spheres replicate vintage blown glass fishing floats of a bygone time. Highly decorative, we make them new in a colorful array for use in home or garden. Sturdy and thick, they will add a pop of color to your home or garden. 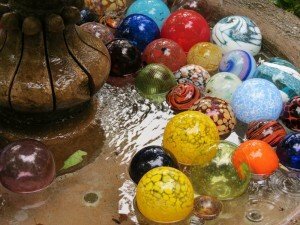 Buy our blown glass floats below or call to order, 206-937-6369.